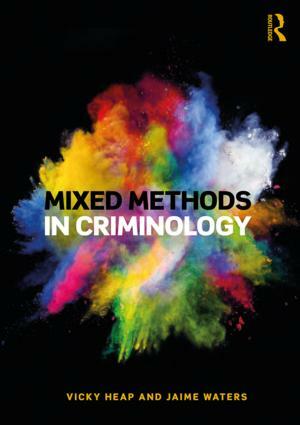 Mixed Methods in Criminology is the first book to bring together the discipline of criminology with the mixed methods research strategy, which has become increasingly prominent within criminological teaching and research. The book is structured so that it charts the course of a criminological mixed methods study. Starting with an introduction to mixed methods and its implications for criminology and criminological research, the book then works systematically through the planning stages of a research project. Developing research questions, aims and objectives is discussed alongside literature searching skills and the project planning process, before the principles and practice of ethical research are summarised. Next come chapters on philosophy, mixed methods design, combining the data, research design and sampling, data collection methods and data analysis; delivering a comprehensive overview of how to undertake a mixed methods research project in practice. This is followed by a chapter on troubleshooting, which provides useful advice from experienced mixed methods researchers, before a detailed account of how to write-up mixed methods research is presented. The book concludes with a range of real-life mixed methods case studies to demonstrate how the techniques outlined in this book have been employed in reality and to inspire new criminological mixed methods projects. Providing straightforward, easy to follow guidance, Mixed Methods in Criminology is the essential student companion for any criminological mixed methods research project. Drawing on the authors' years of experience teaching research methods, the book is written in a supportive and encouraging tone that will serve as a reference and guide for those embarking on their adventures 'in the field'.